Nigerian-American student Ogechi Hubert lives in a food desert, defined by the USDA as an area lacking fresh fruit, vegetables and other healthy food. Often, folks live more than a mile from a supermarket and have little access to transportation. For them, farmer’s markets don’t exist. And, that’s exactly what set Hubert on the path to receiving this year’s Growing Great Leadership Award. In addition to attending Growing Great’s Chef program for two years, the senior, who attends Lawndale’s Environmental Charter High School, has written a thesis about how people of color are often neglected when it comes to nutrition. The Growing Great program was a good fit with the work she was already doing at school. “It’s all about bringing the work into homes and our community,” said Hubert, who with the Chef’s program made dishes such as stir fry, salads, and chocolate-strawberry mousse. 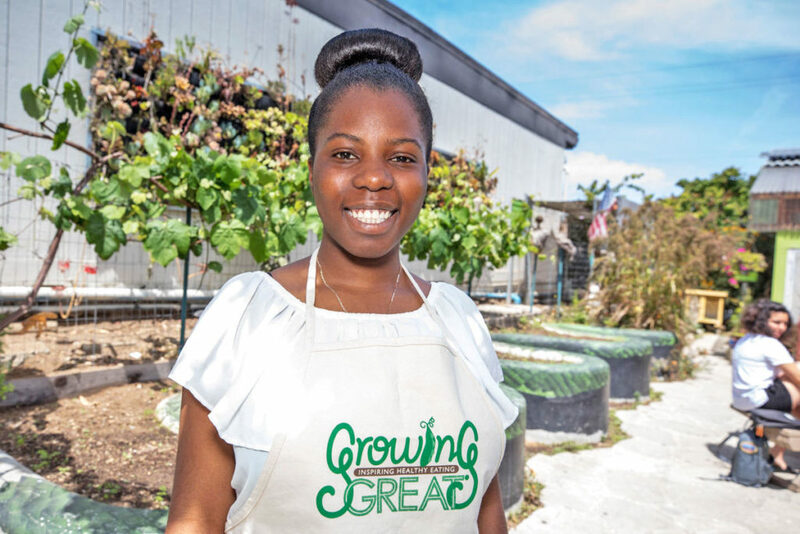 Hubert will speak about Growing Great’s nutrition program and its impact on her life Sunday, April 30, at the 8th annual Farm-to-Table benefit. She’ll speak to a crowd that includes celebrity chefs and honorary event chairs David LeFevre of Fishing with Dynamite, MB Post, and Arthur J; and Andrea and Michael Zislis, the force behind Shade Hotels, Strand House, Rock’N Fish, Rock & Brews. Hubert was selected as a Growing Great leader because she was applying what she had learned in the Chefs program, according to Executive Director Jennifer Jovanovic. Growing Great programs are designed to help families access healthy, organic foods, no matter where they live, according to executive director Jennifer Jovanovic. The program impacts more than 11,000 students and 20,000 parents and siblings each year, with programs that include hands-on nutrition and literacy programs such as From Bean Seeds to Frijoles for PreK – 1st graders, their families and teachers; GrowingGreat Chefs which utilizes the harvest of school gardens to create dishes along with Manhattan House executive chef Diana Stavaridis; and Nutrition and Garden Education, an interactive classroom and outdoor program for grades K-5. At the Farm-to-Table benefit, top L.A. chefs will prepare a farm-to-table dinner, raising funds to support nutrition, garden and science education for children, teens and parents. The benefit is from 5 to 9:30 p.m. on Sunday April 30 at Shade Hotel, 655 N. Harbor Drive in Redondo Beach. Celebrity chefs include Nyesha Arrington from Top Chef, Broken Spanish executive chef Ray Garcia, and Diana Stavaridis, executive chef at the Manhattan Beach-located Manhattan House restaurant. The evening will include cooking demonstrations, wine tastings, a gourmet dinner and desserts prepared by Cupcake Wars winner Stephanie Franz who is also the executive pastry chef at The Strand House and Shade Hotels. A live auction will be followed by dancing. Corina and Marisa McGovern of Manhattan Beach will receive the Green Fork Award, for their work on the mural on the side of the Manhattan House restaurant. For more information on GrowingGreat and tickets for the event, visit growinggreat.org. Originally published at The Beach Reporter.